Jakarta, Indonesia, 26th September 2018 – Archipelago International, Indonesia’s largest hotel group, today announced the signing of a long-term Master Franchise Agreement, with Jeddah based Warifat Hospitality Limited, a subsidiary of Jabal Omar Development Company (JODC), one of the largest listed companies on the Saudi Tadawul Stock Exchange. This multi-hotel agreement grants development and branding rights to Warifat Hospitality for three of Archipelago’s hotel brands: Grand Aston, Aston and Harper and will enable the roll out of these brands, not only at JODC’s flagship development in Makkah but throughout the Kingdom of Saudi Arabia. 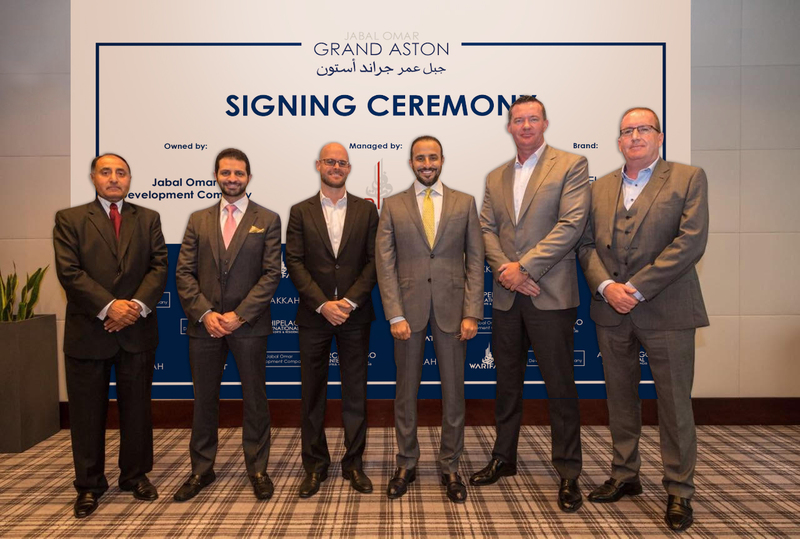 The first hotel being developed under this agreement will be the 560-room Jabal Omar Grand Aston, which is due for completion in July 2019. This 5-star hotel is located in a prime location within walking distance to the Grand Mosque and will be Archipelago’s first hotel in Saudi Arabia, a market it views as one of the most important in its continued expansion internationally. “In strategic terms this is an historic agreement for our company and indeed for Indonesia, as we will be the first Indonesian based hotel company to enter the Kingdom’s hotel market. Our hotel brands are the most widely recognized in Indonesia, which is the largest source market for pilgrims to Makkah and Madinah. This agreement foresees and caters for significant growth from the Indonesian market and it recognizes Archipelago as the hotel group best positioned going forward to cater for the growing numbers of Indonesian and Southeast Asian visitors to the Kingdom.”, said John Flood, President and CEO of Archipelago International. Yasser Faisal Al-Sharif, Chairman of Warifat Hospitality and CEO of JODC said: “We are excited to expand our partnership with an established and leading home-grown Indonesian hotel brand, as its Master Franchisee for the Grand Aston Brand in the Kingdom of Saudi Arabia. We are committed to offering our guests from Indonesia, Malaysia, Brunei and S.E Asia superior hospitality experiences that are customized to their specific needs whilst they visit the Great Mosque of Makkah, Masjid Al Haram and the holy capital. As a part of Jabal Omar Developments strategic growth plan, we believe that by choosing a brand with a proven track record, The Grand Aston Hotel at Makkah shall be a catalyst for growth from the Indonesian and S.E Asian countries for our Hajj and Umrah pilgrims." Archipelago is Indonesia’s largest hotel group with 137 operational hotels (19,000 rooms) across its nine core brands and a further 100 hotels under various stages of development in Indonesia, Malaysia, Philippines, the Caribbean and the Middle East. Its hotels range from ultra-luxurious villas and 5-star hotels to economy hotels and serviced apartment residences. Warifat Hospitality is a newly formed subsidiary of Jabal Omar Development Company (JODC), one of the largest real estate developers in the Middle East and one of the largest listed companies in the Saudi Tadawul Stock Exchange. JODC’s flagship project Jabal Omar, is an integrated real estate development within walking distance of the Grand Mosque in Makkah, incorporating commercial malls, luxurious residential units and premium hotels.